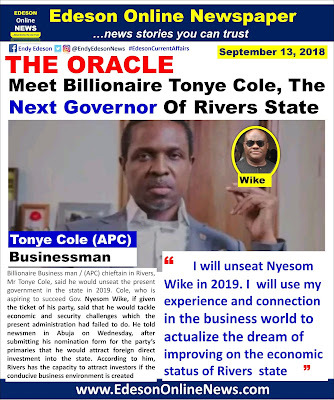 Edeson Online Newspaper: Meet Billionaire Tonye Cole, Is He The Next Governor Of Rivers State? 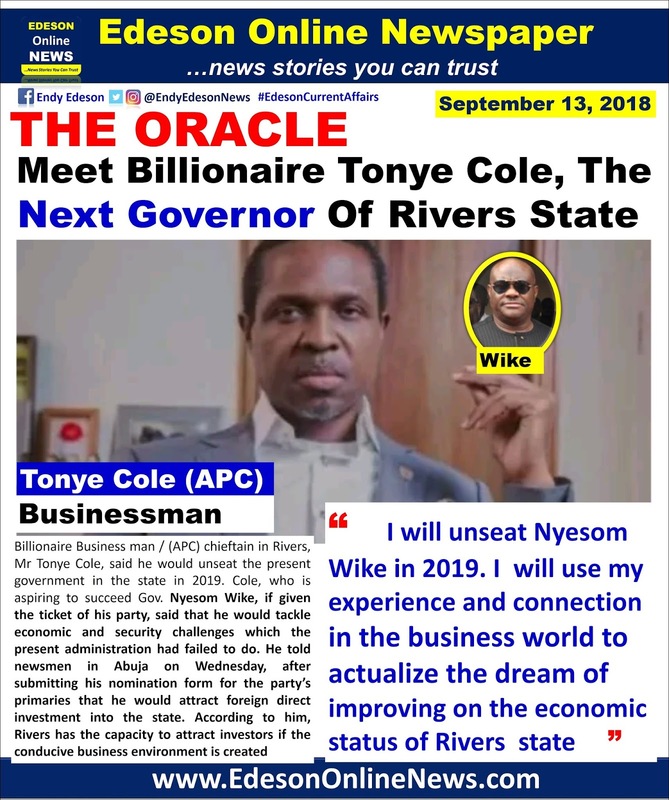 Meet Billionaire Tonye Cole, Is He The Next Governor Of Rivers State? aspiration, adding that he would ensure that rural people were lifted out of poverty. Tonye cole from which party? endy your caption is bias@next gov. he have not even won the primaries! i wonder why nigerian billionires believe so much in their money? how have tonye affected lives positively in rivers state before now? to be frank,i am just knowing he is from rivers. how many children has he given scholarship, how many health care did he built, how many schools did he built in rivers to help the less privillaged??? they should stop indimidating people witkh their money! with his billions,children of the poor are being driven out of school because of fees, why should i vote for him because he is a billionire? how many families are under his shelter?#who his billions epp? Wrong caption,many more hurdles to cross and yet you have declared him winner through your caption. Until then, time shall tell if he will be the next governor of Rivers or not. He should jst play his card well on how to get there. 2019 will be a year of great surprises!